Phil Schiller, Apple's senior vice president of worldwide marketing, speaks about the new Apple iPhone XS, iPhone XS Max and the iPhone XR at the Steve Jobs Theater during an event to announce new Apple products Wednesday, Sept. 12, 2018, in Cupertino, Calif.
SAN FRANCISCO, Calif. — Aram Hardy lives in Moscow. But as a tech entrepreneur, he travels all over the world and,in fact, is planning to move to California. To juggle between the two worlds he lives in, he's used dual SIM cards on his Android phone for years, as do many people living in other countries like China and India. "I save money doing it this way," says Hardy, a co-founder of the Prisma app. 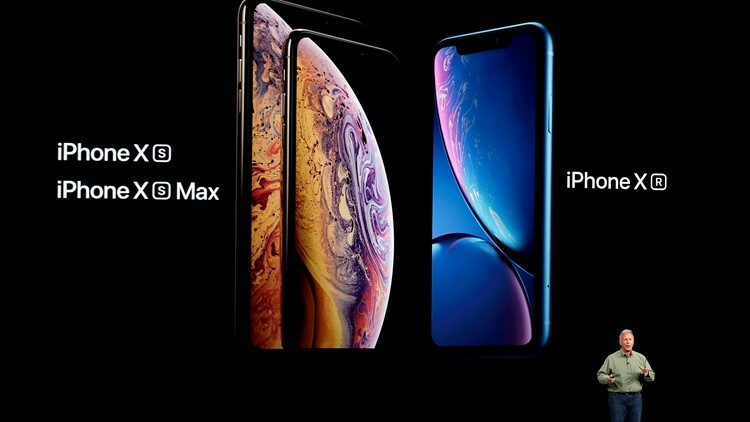 Apple announced this week that the next edition of iPhones would offer the ability to use dual SIM cards – or subscriber identification module, the tiny chip you have to have inside of your phone to connect to a wireless carrier. Phones on the Android system have used them for years globally, and here in the U.S., Samsung Galaxy models have been available this way for quite some. Hardy's mom uses dual SIM cards to make local calls on one, international calls on the other. And he notes that many friends with 24/7 internet sites use two cards from different carriers. "That way, if one goes down, the other is up and running, and their business doesn't suffer," he says. Many travelers have opted to buy a local SIM card when they land in other countries as a way to use their phones while vacationing without having to pay exorbitant sums. Verizon, for instance, charges $10 a day to U.S. subscribers to use their phones while overseas. A local SIM card can cost around $30 for two weeks of use. But with a dual SIM card in place, consumers could have their regular physical SIM card, and order a second, called an eSIM, which is available as an electronic download, before they leave. This way, they would be able to still make phone calls, which most international travel SIM cards don't allow. Roger Entner, an analyst with ReCon Analytics, doubts that U.S. consumers will care much about the dual SIMs, since they haven't shown much interest in the past. "It's great if they go visit Europe, but that's about it." Apple pitched dual SIMs as a way to have one phone number for work, and another for home, but Entner doesn't see that clicking here. He believes Apple is doing this to make the iPhones more useful in China, where dual SIMs is a way of life, and other Asian countries as well. Greg Cohn, the founder of the Burner app, which rents new phone numbers to customers for $5 monthly, is thrilled to see the idea of a second line on your phone going mainstream. Sure, they can pick up a separate SIM when they land on a visit, but that doesn't ensure they'll get all their texts, he says. Some on our Twitter feed pointed out that a second line could be a godsend for cheating spouses who don't want the other to find out about their other lives, but Cohn says it doesn't work that way. "Everything is on one device, he says, with a complete history for both lines." "This validates what we've been doing and not worried about this being a threat to us." Meanwhile, while noting that Apple is making this move in a play for Chinese consumers, Entner has an easy answer for why dual SIM has been popular there and not here. "People are different all over the world," he says. "We're not Chinese."